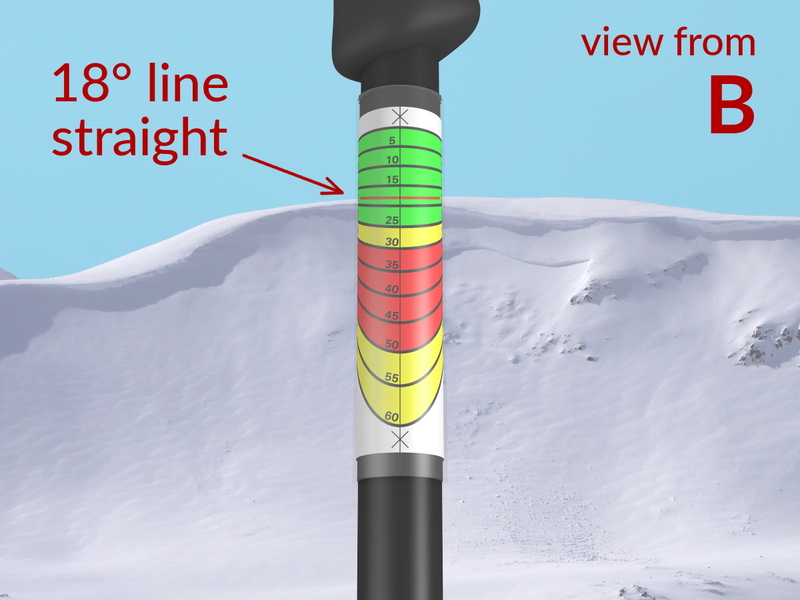 The concept of “alpha angle” can help you identify if you’re a safe distance from a potential avalanche path. Basically, alpha angle is the incline of an imaginary line drawn between the start zone of a slide (its highest point) and the farthest toe of the resulting debris field. 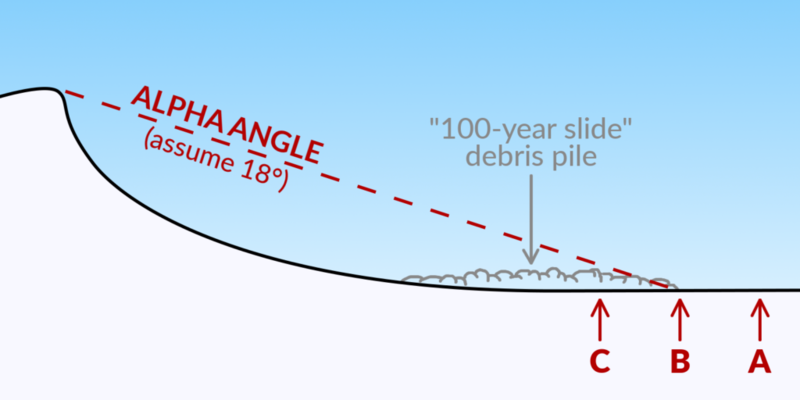 Alpha angles for “100 year” avalanches (i.e. the big ones) are typically in the 18° to 20° range, depending on the specific mountain range and other factors. The safe bet is to assume 18° unless you know otherwise. In the above illustration, it’s easy to see that if there’s any chance of a big slide letting go, you’re much better off in position “A” than in position “C”. So how do you know where you are in relation to alpha angle? Use an inclinometer! Many (but not all) models of inclinometer support line-of-sight measurements so you can determine the angle between you and that cornice looming above you. Most inclinometer phone apps do not tend to work well for this type of line-of-sight measurement. 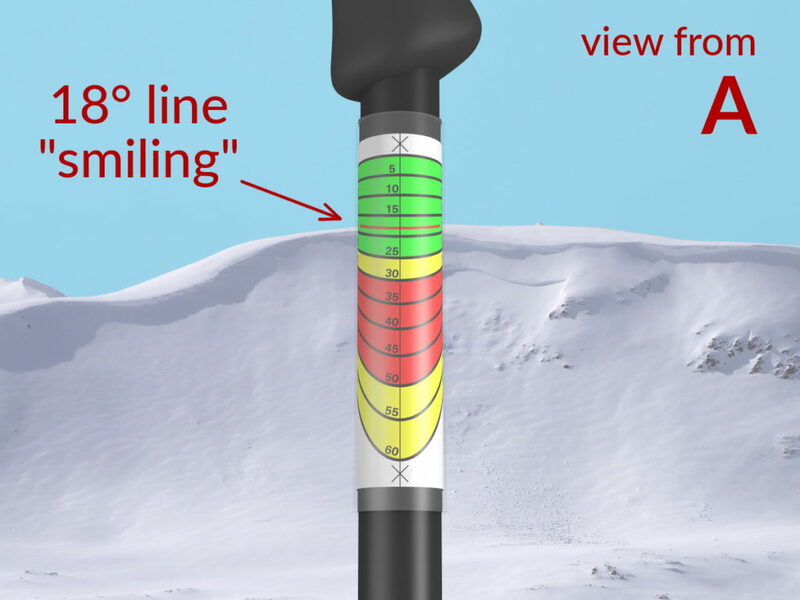 One exception is the excellent Avalanche Inclinometer for Android or iPhone. Not all physical inclinometers work well for these line-of-sight measurements either. The popular BCA Slope Meter cannot be used in this mode unless you have a buddy read the scale while you sight the angle. Examples of physical devices that do work well for line-of-sight measurements are the supremely accurate (if pricey) Suunto PM-5 clinometer, and many mirror-equipped compass clinometers such as the Suunto MC-2 series. Follow the PoleClinometer use instructions to sight to the highest possible start zone of the suspect slide path. The shape of the red 18° line on the sticker will tell you whether you’re closer or farther than the toe of an 18° slide, as shown below (in views from the three positions indicated in the top diagram). If the 18° line is curved up (“smiling”), you’re in a good spot. You’re beyond the reach of even the biggest slide from that slope. 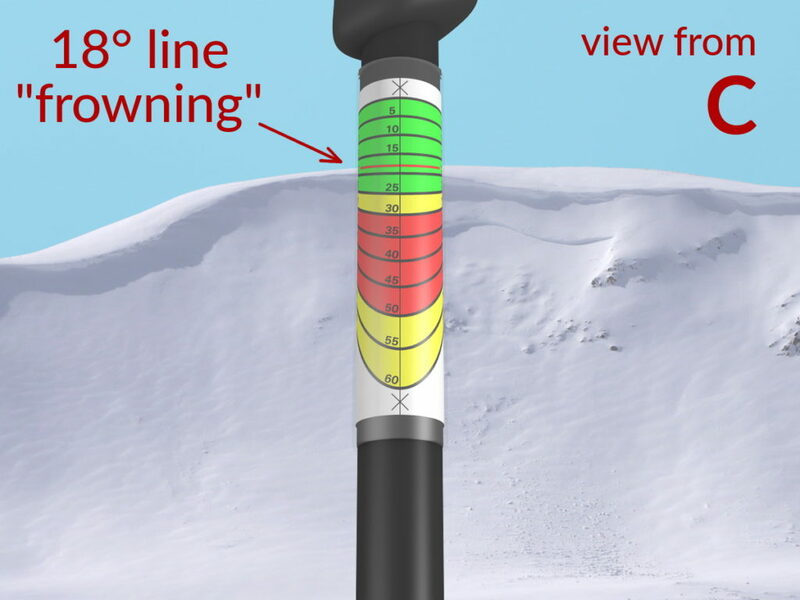 If the 18° line appears straight, you could be right at the edge of the danger zone if a big slide were to let loose. If the 18° line is curved down (“frowning”), you’re right in the firing line. Might not want to linger here unless you’re confident there’s very low risk of avalanche on the suspect slope’s aspect etc. Obviously, alpha angle is not going to tell you everything you need to know to stay safe in the mountains. But it’s certainly a useful tool to add to your quiver. It’s well worth having an inclinometer (or two) that you trust when you venture into avalanche terrain. And of course keep up your avalanche skills training to better incorporate all your tools for traveling safely in the mountains.